Dog training has moved on from the old fashioned techniques that used punishment based training. They might look like they sort a problem quickly, but often would suppress bad behaviours rather than resolve them and cause a great deal of mental and physical stress for our dogs. We adhere to the IMDT code of ethics and promote modern scienced-based techniques that aim at achieving our goals using the least invasive training method for the dog. Training takes time and effort and there are no quick fixes, but it also needs to be enjoyable for you and your dog. By understanding how learning takes place and how behaviour is changed we can build a great bond. By training with reward-based techniques you will get a well-trained and very importantly a well-balanced dog. There are lots of options for training depending on your needs and the needs of your dog. You can join in a class, or you can train on a 1 to 1 basis. I can do 1 to 1s at my own location or at yours, or at another location such as where a problem behaviour occurs. West Cornwall Dog Training is owned and run by me. I am an Institute of Modern Dog Trainers qualified dog trainer and behaviourist and also a full member of the Pet Professional Guild. After competing with my own dog in agility for many years I moved to Cornwall and started running agility classes in St Just. They went well, but I was increasingly being asked for other sorts of training and to run non-agility classes. Seeing the demand for locally run reward-based dog training classes, I gradually built up knowledge, gained further experience and qualifications. The majority of my work is now problem solving training and behaviour one to ones, workshops such as tracking, as well as supporting my trainers and helping them advance their own career. For more information click here. My dog Oodle, who is a Cavapoo, needed something to “do” when she was re-homed at the age of 7 months, her energy was high and was always getting up to mischief. So I found agility with Carolyn at St Just. After her first year of training I decided to register her as an Activity dog with the Kennel Club and enter a local competition and she hasn't looked back. Successes include coming 3rd in the national finals in the UKA steeple chase held at Clevedon near Bristol. 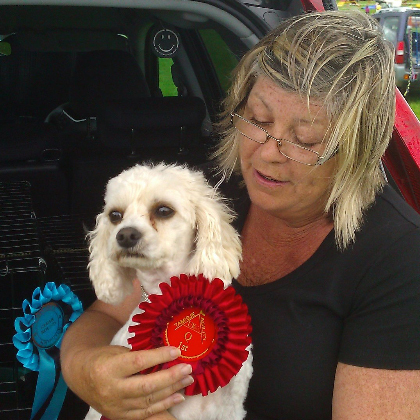 My second dog Will-e, a Toy Poodle, completed some lovely agility runs in his first season including some 1st places and I have high hopes of much more success to come. In 2014 I began assisting at classes at West Cornwall Dog Training and my interest in dog training grew. I now run agility classes and have gained IMDT membership. I have always loved dogs and grew up with collies and spaniels. My own first dog, Ness, was an eight month old rescue dog, She was shy, and I wanted to build a bond and learn to communicate with her so took her to training classes. A few years later, Sam, a nine month rescue border collie joined our family. Sam finds life challenging and through him I discovered some great dog trainers and the world of positive training. After studying for a social work degree, I realised that I spent more time relating the theories that I learnt to Sam rather than people, and on qualifying promptly went to work for a local rescue centre. Since then I have qualified as a dog trainer with the IMDT, set up a dog training and walking business, and continue to study to increase my knowledge. I have been shadowing Carolyn's classes for a few months I was delighted when she asked me to join the West Cornwall Dog Training team. We are always on the lookout for enthusiastic and committed volunteers to help out at classes and workshops. Whether you are looking to be a dog trainer, or just enjoy life with dogs, do get in touch. In the first instance email Carolyn at [email protected] with some information about yourself, any qualifications you have or are working towards, and why you would like to join us - then one of the team will then be in touch as soon as we can.